Mule Skinner Jimmy Simpson cuts his way through a field Saturday near the Cannon County Arts Center. 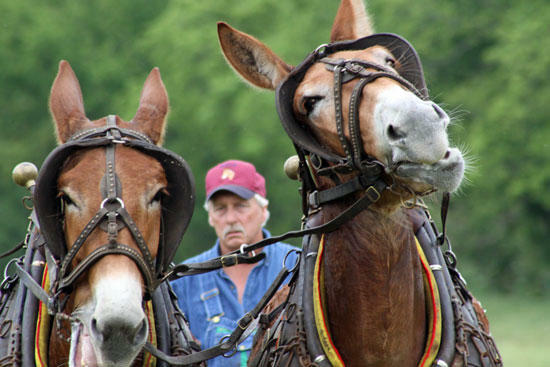 Members of the Middle Tennessee Mule Skinners Association will be spotlighted in an upcoming edition of the Nashville Public Television show "Tennessee Crossroads." About a dozen mule skinners (drivers) were filmed in action by a cameraman as they cut a field of grass off John Bragg Highway near the Cannon County Arts Center. Middle Tennessee Mule Skinner President Andrew Duggin was among those interviewed for the program. No air date has been announced at this time. The annual MTMS Woodbury Mule Show will be held next Satuday, May 12, at the Clayton Glenn Arena at the Cannon County Fairgrounds beginning at 11 a.m. Admission is free. Terry Preston leads a team of mules through a field Saturday while a segment of "Tennessee Crossroads" is being filmed.